The number of wireless devices in our lives is multiplying at a torrid pace. Tech-savvy households can easily include over a dozen devices between smartphones, tablets, PCs, game consoles, smart TVs, digital assistants, and an expanding array of IoT gear. That’s a lot to manage under one roof, especially during prime time, when concurrent streaming, surfing, and gaming sessions all want their share of available bandwidth. With higher throughput per channel and the ability to pack data from multiple clients more efficiently into the available spectrum, next-generation 802.11ax WiFi is built for busy networks. We’ve deployed it across a family of new routers capable of keeping up with your appetite for digital devices. The ROG Rapture GT-AX11000 offers the highest speed and capacity for gamers and enthusiasts who demand the very best. It’s joined by the AiMesh AX6100, a compact mesh networking system that spreads WiFi between multiple hubs to expand coverage for larger homes, and the RT-AX88U, a feature-packed router tuned for performance and configurability. The latest iteration of 802.11 WiFi was designed for high-density public installations like airports and stadiums, so it has ample capacity for power users who want to future-proof their home networks. 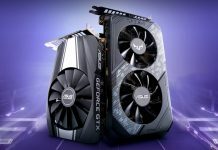 It borrows techniques from the cellular industry to serve more devices simultaneously and better cater to their individual needs, whether that’s lower latency for lag-free gaming or guaranteed packet delivery for uninterrupted streaming. Unlike its 802.11ac predecessor, which is limited to the 5GHz band, 802.11ax is capable of operating in both 2.4GHz and 5GHz territory. The maximum throughput per band is higher thanks to 1024-QAM modulation, which allows the wireless carrier signal to carry more information. This upgrade enables speeds up to 25% faster than the 256-QAM modulation introduced with 802.11ac. In multi-user environments, higher throughput for individual devices isn’t as important as greater capacity for concurrent connections. The broader MU-MIMO implementation in 802.11ax improves real-world performance by allowing access points to communicate with more devices at the same time. Support for up to eight downstream and eight upstream channels represents a substantial increase over the four downstream and one upstream link available in 802.11ac. The huge improvement in uplink capacity is especially good for live-streaming with services like Twitch and Periscope, and for uploading high-resolution images and videos to social media. While MU-MIMO increases the number of lanes capable of carrying traffic, a technique taken from 4G LTE technology makes more efficient use of each one. In OFDM system used with 802.11ac, access points communicate with one client at a time on each channel, while the next client waits its turn. The virtual truckloads traveling in each lane can only carry data for one user, but users don’t necessarily have enough information for a full load, which leads to wasted capacity. In 802.11ax, the signal is split into sub-channels using Orthogonal Frequency Division Multiple Access, or OFDMA. Each truckload can carry data for multiple clients, and the distribution changes based on demand. This approach uses available bandwidth much more efficiently, and it also lowers latency by allowing high-priority data to hitch a ride sooner, without languishing in line. Combined with smarter scheduling, OFDMA is the key to allowing 802.11ax access points to manage the torrent of data and multitude of devices in crowded wireless networks. 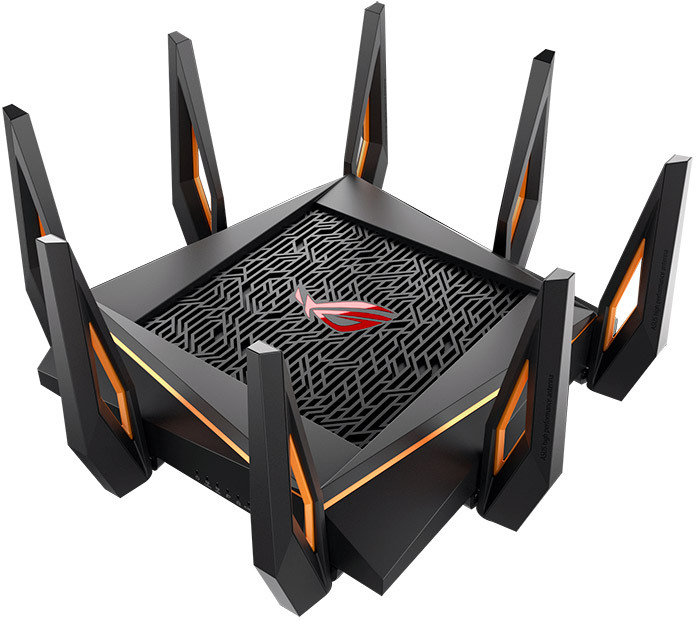 The Republic of Gamers is renowned for cutting-edge hardware, so it’s fitting that the new ROG Rapture GT-AX11000 is the world’s first tri-band 802.11ax router. It’s built for the most demanding networks, with peak aggregate throughput of nearly 11,000Mbps: up to 1148Mbps on the 2.4GHz band and up to 4804Mbps on each of its dual 5GHz bands. The extra 5GHz band can be reserved for gaming devices to prevent other wireless activity from interfering with your primary machines. With WiFi Radar, the router can then analyze the surrounding environment and use DFS band switching to hop the dedicated gaming band to the best channel for maximum performance. Most wireless routers also include Gigabit Ethernet for wired connections, but the Rapture GT-AX11000 goes one step further with a 2.5Gbps Ethernet port capable of much higher hardline speeds. The extra bandwidth allows a single system to communicate with multiple gigabit-class devices at top speed, or exploit NAS devices that team multiple ports to achieve higher throughput. The 2.5Gbps port can also be switched into WAN mode to take advantage of internet connections that offer greater than gigabit speeds. When AiMesh support is added in a future firmware update, you’ll be able to run 2.5Gbps wired backhaul to combine two Raptors across a larger area with lots of physical obstructions. Traffic from the 2.5Gbps port is automatically sent to the front of the line, and there are other ways to prioritize packets, too. Game Boost adaptive QoS analyzes network activity and automatically bumps gaming traffic ahead of everything else, preventing high-bandwidth tasks like downloading and streaming from introducing lag to multiplayer gaming. And support for the WTFast Gamers Private Network provides an optimized path for gaming packets when they leave the router, extending acceleration from your home LAN to the internet at large. All of our 802.11ax routers will support AiMesh, an exclusive ASUS technology that allows you to mix multiple routers to create your own mesh network, but the new AiMesh AX6100 WiFi System is purpose-built for the task. It comes in a two-pack of RT-AX92U nodes that lets you easily extend coverage to the far corners of your home, eliminating the dead spots that can occur when a single router tries to service a larger environment. The body is also much more compact than our 802.11ax alternatives, so you can tuck each router discretely out of the way. Despite its small size, each node is a tri-band design capable of peak aggregate throughput up to 6100Mbps. Much of that bandwidth manifests in the 5GHz 802.11ax band, which pushes up to 4804Mbps all on its own. This band is used for backhaul communication by default, providing an ultra-fast link between mesh nodes. Another 5GHz band offers 866Mbps of bandwidth for 802.11ac gear, while the 2.4GHz band serves up 400Mbps of 802.11n connectivity for older devices. 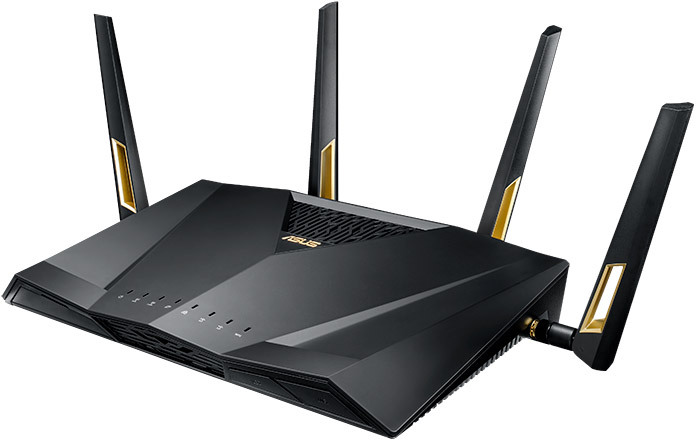 Although the AX6100 lacks the 2.5G wired Ethernet available on the Rapture, it matches the ROG router’s assortment of Gigabit Ethernet ports: one for WAN and four for LAN. The true number of LAN connections is effectively double that, since each node in a two-way mesh system has the same port payload. You can shift backhaul traffic to a wired Ethernet cable linking the two nodes if you want to reserve all of the wireless bands for client devices. It’s also possible to add nodes using other AiMesh-compatible routers, even if they’re based on 802.11ac. 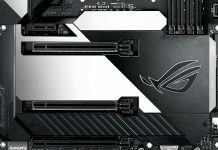 The ROG Rapture GT-AX11000 and AiMesh AX6100 are both debuting at Computex, but the RT-AX88U was actually introduced last year. This 802.11ax router has much of the same underlying hardware as the Rapture applied to a more conventional dual-channel design. Both bands support 802.11ax devices, with up to 1148Mbps on 2.4GHz and up to 4804Mbps on 5GHz, for peak total bandwidth around 6000Mbps. Wireless signals are passed over four antennas, while wired connections are handled by one Gigabit WAN port for your ISP and eight LAN ports for local devices. With twice as many LAN ports as its peers, the RT-AX88U is ideal for environments with lots of wired clients in close proximity, like small businesses running desktop PCs and home offices with lots of local machines. Like its tri-band ROG counterpart, the RT-AX88U is controlled by a potent quad-core processor. It has dual USB 3.1 Gen 1 ports for shared peripherals like storage or a printer, and you can even add a 4G dongle for a backup WAN connection in case your normal internet service is disrupted. Gamers can also hop on the WTFast GPN to have networking packets accelerated once they leave the router. 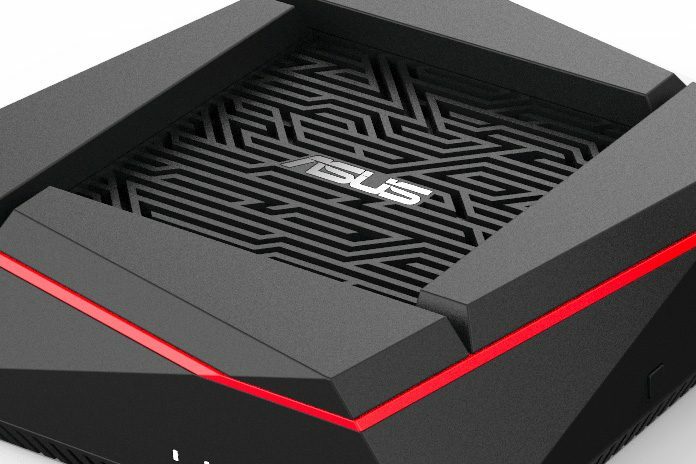 ASUS has a long history of producing highly regarded routers, as evidenced by our seventh consecutive year earning the PCMag Readers’ Choice Award for overall customer satisfaction in the category. All of our 802.11ax models share core features that make your home network easy to configure, secure, and expand. The ASUSWRT web interface provides fine-grained control over every aspect of your router, and it’s joined by a powerful ASUS Router App that brings extensive configuration and monitoring options to Android and iOS devices. Adaptive QoS lets you choose between automatic prioritization for performance-sensitive tasks and customizing your own preferences for how to treat different kinds of traffic. Trend Micro provides up-to-date security via AiProtection Pro. This commercial-grade security suite scans both inbound and outbound traffic and automatically blocks common attacks. It restricts access to malicious websites to prevent inadvertent clicks from compromising your machine, and it can even identify infected machines on your local network and prevent them from communicating with servers that may be trying to steal personal data. You can further restrict network access with parental controls that now include the ability to associate a group of devices with each family member, which eliminates the hassle of having to manage each one individually. Home networks often need to grow, whether it’s expanding capacity to serve additional devices or extending reach to cover larger floor plans and outdoor spaces. AiMesh makes both easy by allowing compatible ASUS routers to work together in a mesh network that spreads WiFi over a larger area. Unlike competing mesh solutions that require all-new hardware, AiMesh is compatible with many existing ASUS routers, allowing users to keep the hardware they have and incrementally add new AX nodes as needed. 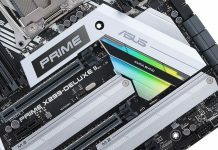 AiMesh also lets you keep using the advanced ASUS features embedded in our routers, so you’re not stuck with the basic options of more simplistic mesh solutions. 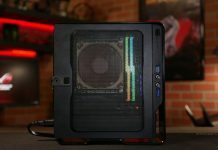 The AiMesh AX6100 works with AiMesh out of the box, while the Rapture GT-AX11000 and RT-AX88U will add support in firmware updates after launch. 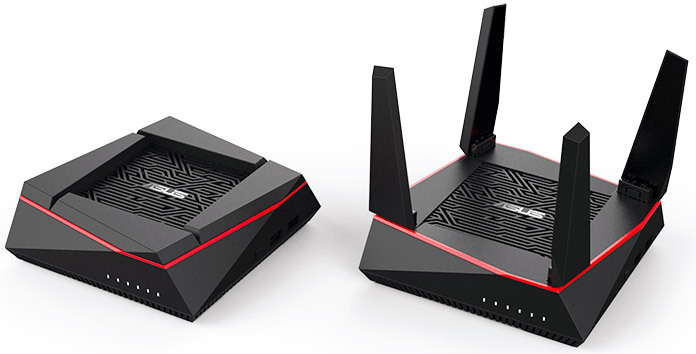 The ROG Rapture GT-AX11000, AiMesh AX6100, and RT-AX88U complete a collection of ASUS 802.11ax routers that tailor next-gen wireless connectivity for different kinds of deployments. Look for them to arrive in North America in Q3, and check with your local ASUS representative for details about availability in your region. 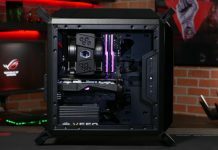 Check out our many other Computex 2018 product announcements. 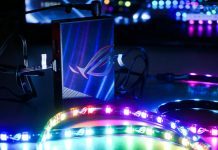 Skip over to this article for a summary covering the entire ASUS line-up at the 2018 show.